Black Beauty ($6.95) 85 days. A dark, meaty, very rich-fleshed tomato with extreme anthocyanin content, the same antioxidant in blueberries and blackberries. Beautiful to look at and flavor is deep, rich and complex. Combined in a tomato salad with red, orange and yellow tomatoes - a real mind-blower! So dark that some tomatoes turn solid blue-black on the skin. Deep red flesh is among the best tasting of all tomatoes. Rich, smooth and savory with earthy tones. Be sure and wait for true ripeness! Black beauty takes a while to ripen but is definitely worth the wait. Keeps well on the vine and stores very well, and the flavor improves with room-temperature storage. Baker Creek's Dave Kaiser tasted it at the 2015 National Heirloom Exposition and proclaimed it as the BEST tomato he had ever eaten! Photograph from Baker Creek Rare Seeds. Black Ethiopian ($6.25) 80 days. This spectacular tomato from the Ukraine has an exquisite flavor – just knocks me out. Be prepared for extremely heavy production of deep reddish brown-bronze 3 to 5 oz. luscious plum shaped tomatoes, sweet, rich and tangy – just ambrosial. Black Ethiopian’s exceptional production and splendid flavor have made it highly prized in the tomato world. A beautiful and rare tomato which bears all season long. Black Krim ($6.25) 75 days (E) This much sought after Russian variety is unique and unforgettable, originally from Krim (Crimea) on the Black Sea, Black Krim has a superb smoky sweetness with a delicate lingering touch of tang in a 4-6" slightly flattened, mahogany-colored fruit with lovely, deep green shoulders. Setting fruit at higher temperatures, it is superb and very easy to grow. (It is not the same variety as Noir de Crimeé). Look at this gorgeous tomato! Its deep, earthy sweet flavors will blow your mind. This one is a challenge to share--you'll want to hide them for yourself before they disappear into the hands family and friends! True Black Brandywine is a workhorse of a tomato plant -- grows loads of big beautiful tomatoes in clusters of 3 or 4. Incredible tasty and productive --producing dozens of ripe fruits every few days. Loves the heat, stands up to diseases and is a treasure for your tomato garden. A cross between Brandywine and an old time brown variety called Fejee Improved, the seeds were given to the folks at Baker Creek Rare Seeds by William Woys Weaver from his grandfather's seed collection from the 1920's. Cherokee Purple ($6.25) (HG) (E) 75 days. A legendary and beautiful tomato, at least 100 years old and said to be grown by the Cherokee People. 12 oz. deep dark dusky rose-purple, deep red inside, with sweet, rich and smoky, luscious flavor. Cherokee Purple is a garden staple, in everyone's favorite list for a good reason-- disease resistant, reliable and easy to grow, and great one for your heirloom or heritage garden. Seeds were sent to Craig Lehoullier by JD Green of Tennessee who got them from a neighbor whose family had grown them for more than 100 years. In 1990 Craig named it Cherokee Purple. 80 days. This exceedingly rare, beautiful and incredibly delicious variety is the first tomato that I can say rivals my all-time favorite, Paul Robeson. Everyone who tastes it goes mad with tomato love and says it is the best tasting tomato they have ever tried, bar none. 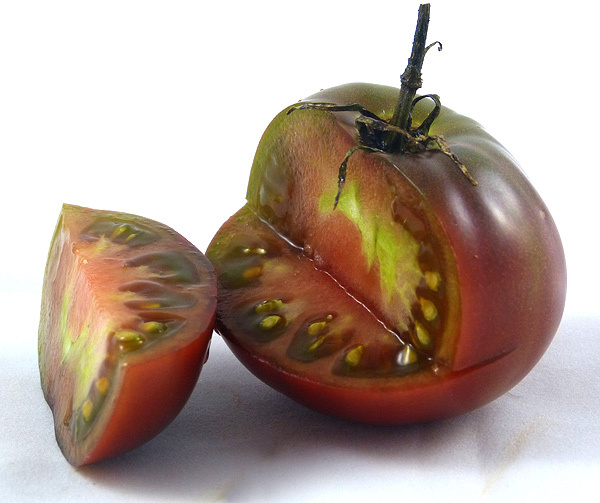 The flavor of this deep chocolate-brown tomato, as described by Lisa of Amishland Heirloom Seeds, " a distinctive, winey, smoky, rich taste and fabulous color." Lisa was the first to offer seeds of Chocolate Amazon which were sent to her by her Ukrainian friend, Sergey. Double the size of most other black tomatoes, reaching 1 lb. or more, extremely prolific and pumping out sweet, luscious, juicy tomatoes right into the cooler weather, Chocolate Amazon is in our top three discoveries for your 2009 garden. Chocolate Stripes ($6.25) 85 days. Foxy Lady ($6.25) (E) (HG) (70 to 75 days). This rapturous little cousin of Purple Haze is one of the newest additions to our heirloom cherry selection. The flavor, is energizing, elaborate and dazzling with a sweet, seductive background and earthy nuance with lingering flavors. A tiny touch of tang balances its big full-bodied sweetness. I am madly in love with this tomato. Big tomato, little plant. 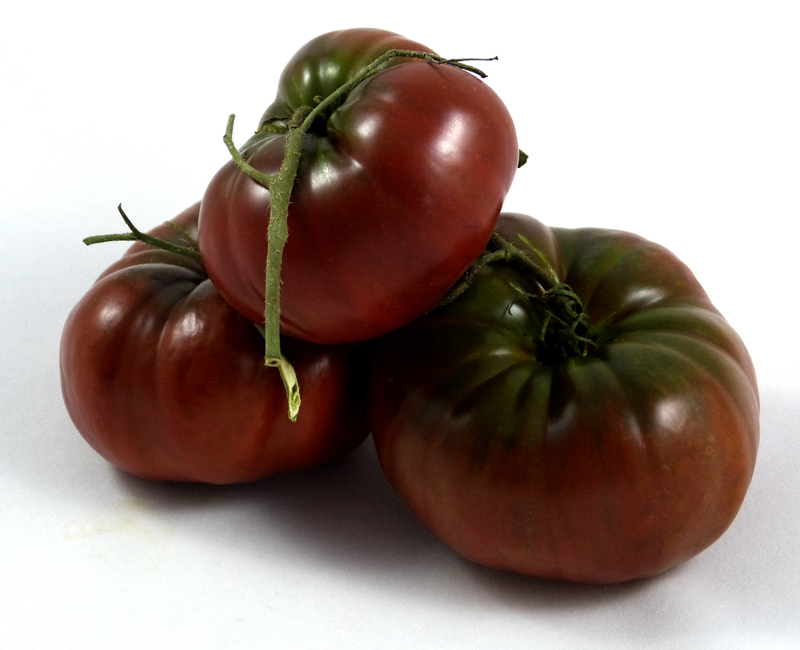 Tasmanian Chocolate is a beautiful variety that produces huge tomatoes on very compact plants. Large, beefsteak style fruits can grow to almost a pound and ripen to a deep chocolate-red. What really makes it unique is the dwarf growing habit, with small plants only growing to 2-3 feet, but still loaded with big fruits! Great for small spaces and containers. Japanese Black Trifele AKA Japanese Black Truffle ($6.25) (SM) 80 days. Japanese Black Trifele, which translates to truffle, is a medium sized, juicy 3 to 4" inch long 6 - 8 ounce pear-shaped, deep purple-black tomato with pretty green shoulders. In Russia the Trifele varieties of tomatoes--of which there are several colors--are highly prized and command high prices. Growing on a short potato-leafed plant, it's the size and shape of a Bartlett pear and among the darkest hued and finest flavored of the black tomatoes. The skin is smooth and crack resistant and production is huge. Don't over-water and you will be rewarded with flavor that is deep, chocolaty, smoky and rich, just wonderful. Took their picture and ate 'em. Lavender Lake ($6.50) 85 days. These plump, deep purple 8 to 10 oz. tomatoes are really sweet and full flavored. Tangy and rich -- the perfect tomato for sandwiches, salads and fresh eating. Add to the mix, Lavender Lake grows beautifully in large containers and in the main garden and has a juicy, meaty, yet silken texture. Never mealy. One of the most beautiful tomatoes, it is very productive in all climates. At full ripeness, I compare it to the best of the Brandywines! This stunning photograph is the property of Heritage Tomato Seeds/Bunny Hop Seeds. Go see their seeds, a fabulous selection! Paul Robeson ($6.25) (VE) (HG) 65-70 days. This is my all-time favorite tomato and our top seller. It is a gorgeous, dark and dusky-hued fruit with intensely sweet earthy taste with a hint of tanginess, a luscious velvety smooth texture, beautiful skin, rich with juice and high production. You will love it. The seed was made available by Marina Danilenko, a Moscow seedswoman. 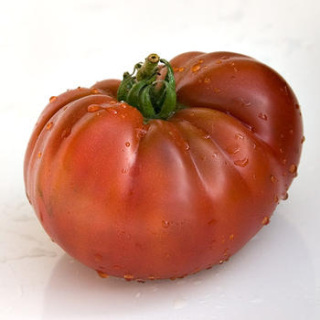 This luxurious tomato is named for Paul Robeson (1898-1976), the elegant, renowned and charismatic operatic singer, law school graduate, champion athlete, film star, stage actor and boundlessly brave champion of civil and personal rights throughout the world. This marvelous plant will give you its perfect 3" - 4" fruit in only 65 days from planting. Incredible; a symphony. I do believe this is the finest tomato in existence. This little sweetie is a fabulous cousin of Purple Haze, yet this one grows tomatoes that are twice the size and is outselling Purple Haze by a long shot. Not a cherry, but small. Tomatoes this size, 2", are called 'saladette'. Sweet Leilani is a very heavy producer with clusters of 6 to 10 incredible delicious purple tomatoes. I am happy to name it for my granddaughter Leilani who is beautiful, dusky, sweet (usually) and a sassy little thing.